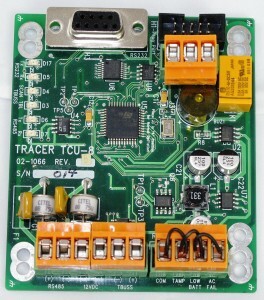 TCU-8 & TCU-8M | Tracer Electronics, Inc. The TCU-8 Controller provides an interface between the T-Buss™ IDM™ devices and your system. It monitors & controls up to 99 IDM™ points plus three controller inputs. The TCU-8 communicates with a PC (or your system) via RS485 or RS-232. Your system should communicate with one or more TCU-8 modules via the RS-485, leaving the RS-232 port open for diagnostic purposes that allow you to monitor and control the TCU-8 while at the local TCU-8 device via a laptop. The operating program resides in FLASH memory. The TCU-8 requires 12VDC @ 100MA for normal operation. The supply should be capable of outputting 300MA in order to detect and report a T-Buss™ line short. TCU-8 is supplied with Tracers Proprietary operating system that provides full features and capabilities. The communications protocol is available to an OEM with a signed NDA. TCU-8M is supplied with an operating program that responds to MODBUS protocol. While not as feature rich as our proprietary protocol, it does provide a “plug & play” capability with your MODBUS based system.